I am often asked where I got all my information from. 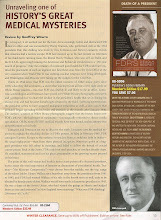 Most people assume that there is a file at the FDR Library or some learned treatise that lays out the truth of Franklin Roosevelt's medical history and that an autopsy was performed that confirms the existence of the multiple cancers that were ultimately responsible for the deterioration and demise of our late, great thirty-second POTUS. Of course this is not the case. The pieces reside scattered in countless volumes and documents, often just a word, a phrase or sentence or paragraph. We have been able to reconstruct the puzzle, not completely, but enough to see the big picture. I recently found another small but significant piece in a work I was made aware of by a wonderful South Carolina historian who is researching an important book on Marguerite "Missy" LeHand, the first second, third or fourth most important woman in FDR's life if one were to try to assign priority with Margaret Suckley, Lucy Mercer Rutherfurd and Eleanor (my take is a very close number two to ER). The information is contained in a wonderful book entitled "Behold the Dreamer", the story of Fulton Oursler, the reporter who did quite a bit to get FDR elected in 1932. The last portion of the book is actually a separate work entitled "Through the White House Side Door". Incidentally the side door was the one where people could come and go without being "signed in" a la Howard Bruenn. Aside from many wonderful anecdotes worth reading by the FDR afficionado, the last sentence on page 439 describes an incident where FDR "got his dutch up" and reads "I noticed a flap of flesh that had grown over his left eye and other visible physical deteriorations." For the record, he "flap of skin" did not grow there, it was put there as a graft to cover up the ongoing removal of FDR's melanoma. What Oursler saw saw is likely what can be observed in the accompanying photograph, this one from 1942. To directly dispute what Howard Bruenn told Jan Herman in 1989, this is not a "photographic error".